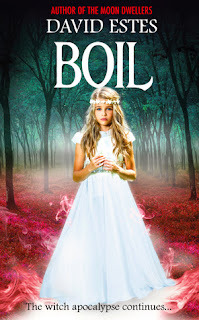 Boil (Salem's Revenge #2) by David Estes is available at Amazon. Here's my review of Brew (Salem's Revenge #1). I can't not include Hazel Dickens in this review, who does my favorite version of the old mountain ballad, Pretty Bird, mentioned by Trish at the end of this book. Revenge. That’s all that’s left for witch hunter Rhett Carter. The magic-born have stripped everything from him—killed his friends, cursed his warlock father, shattered his future—leaving him bare and broken, but not dead. Their mistake. When Rhett and Laney are suddenly thrust in different directions, Rhett must decide who to trust and who to kill. Backed by his trusty canine sidekick Hex, Rhett will embark on his deadliest mission yet, one that will lead him directly toward those who want him dead, pushing his unique resistance to magic to the edge and back again as he tries to remove his father’s curse. This book picks up where Brew, the first book in the Salem's Revenge series, left off with one major difference - Rhett Carter is no longer alone. He's part of a team now and this is reflected in changes of character-POV with Lacey and Trish Grant, who Rhett picked up while traveling through my home state of West Virginia. West Virginia gets less face-time in this book than it did in Brew, but I love that my state is mentioned without us being depicted as a bunch of backwards hill folk. The POV-changes allow the story to progress faster than the first book, so there's less roller-coaster effect. And, as with the first book, this would be a cool movie adaptation requiring nifty special effects. I would also recommend this to anyone who loves Paranormal Romance for young/new adults. Mr. Estes shies away from the notion of love-at-first-sight and shows a real relationship being built. At the end of the book, Trish borrows a line from a very popular ballad here in West Virginia called Pretty Bird, which tickled me. If you wanna hear how we West Virginians listen to the song, look up the version done by Hazel Dickens (rest in peace, Hazel Dickens, you are gone but not forgotten). I can't talk about what happens to Trish without giving spoilers but she'll always be my favorite character from this series. I look forward to reading the third installment of the Salem's Revenge series.